Ester-C 500 mg with Citrus Bioflavonoids is an excellent product for the money. 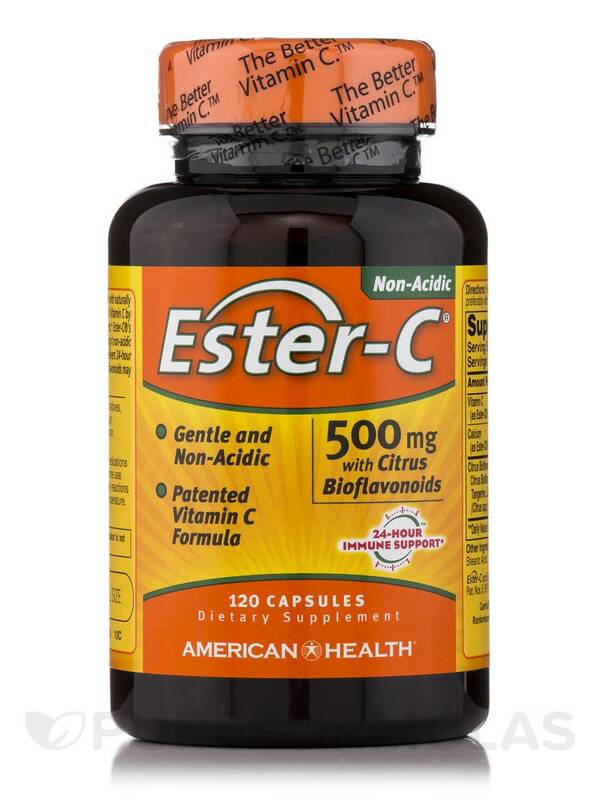 Ester-C 500 mg with Citrus Bioflavonoids is a form of C that does not upset your stomach,empty or not. I like the citrus bioflavonoids to the vitamin c in Ester-C 500 mg with Citrus Bioflavonoids by Ester-C.
- Gentle on the Stomach. 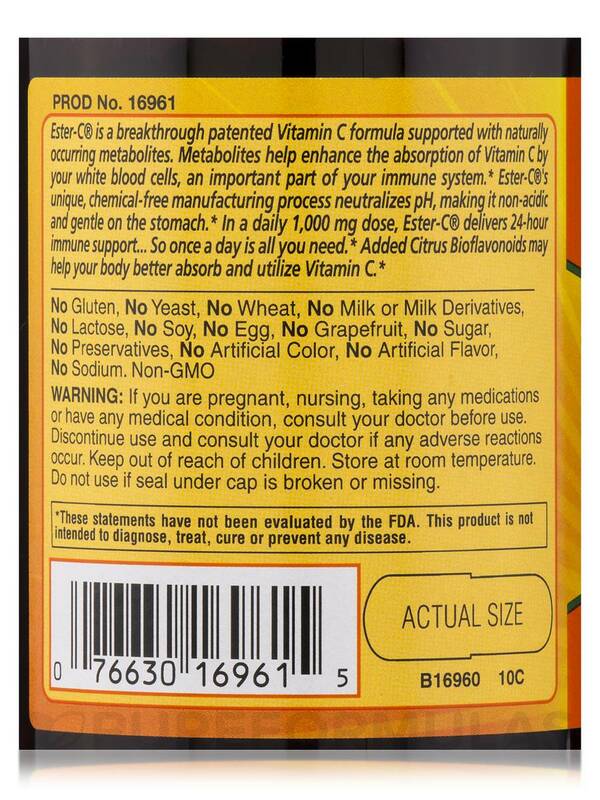 - Patented Vitamin C Formula. Ester-C® is a breakthrough patented Vitamin C formula supported with naturally occurring metabolites. Metabolites help enhance the absorption of Vitamin C by your white blood cells‚ an important part of your immune system. Ester-C®'s unique‚ chemical-free manufacturing process neutralizes pH‚ making it non-acidic and gentle on the stomach. In a daily 1‚000 mg dose‚ Ester-C® delivers 24-hour immune support...so once a day is all you need. Added Citrus Bioflavonoids may help your body better absorb and utilize Vitamin C.
Other Ingredients: Gelatin‚ Vegetable Cellulose‚ Vegetable Stearic Acid. For adults‚ take two (2) capsules once daily‚ preferably with a meal. If you are pregnant‚ nursing‚ taking any medications or have any medical condition‚ consult your doctor before use. Discontinue use and consult your doctor if any adverse reactions occur. Keep out of reach of children. Store at room temperature. Do not use if seal under cap is broken or missing. No Gluten‚ No Yeast‚ No Wheat‚ No Milk or Milk Derivatives‚ No Lactose‚ No Soy‚ No Egg‚ No Grapefruit‚ No Sugar‚ No Preservatives‚ No Artificial Color‚ No Artificial Flavor‚ No Sodium. Non-GMO. 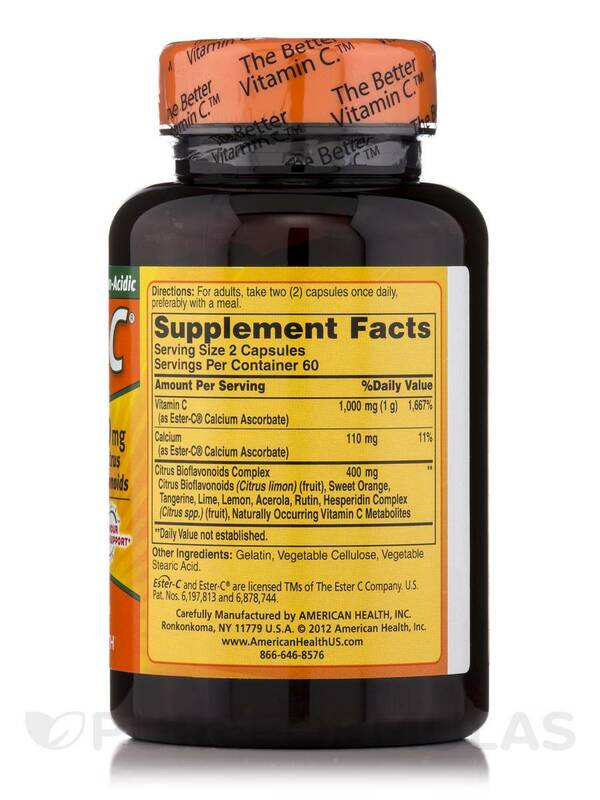 I have used this Vitamin C and it is a good quality and easy to absorb. When you cannot tolerate regular Ascorbic Acid Ester-C 500 mg with Citrus Bioflavonoids is a great way to get extra vitamin c and cofactors in your diet. I already eat a diet high in food sources, but this alongside has been helpful in keeping Vitamin C levels good based on Nutreval testing. No upset tummy with this one. I take two per day, especially with my iron sups to help with absorption. I have tried other Vitamin Cs that have irritated my stomach. 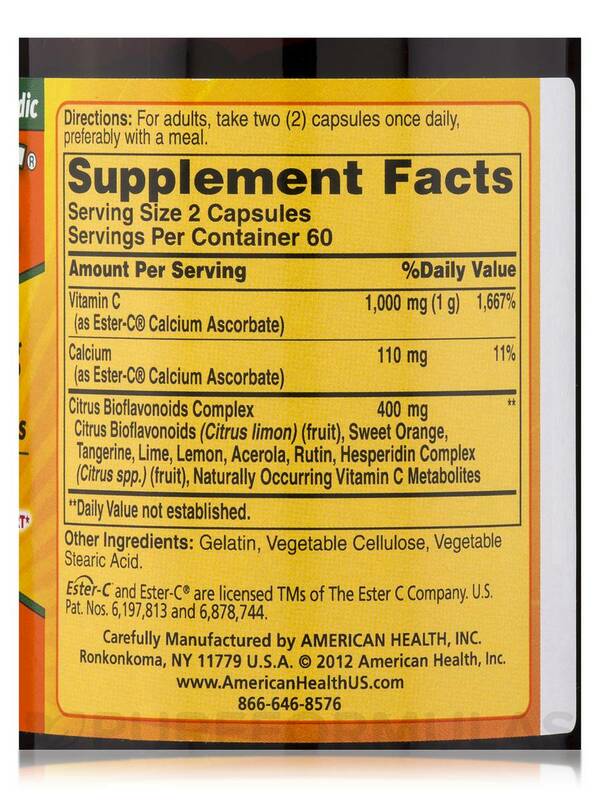 Ester-C with Citrus Bioflavonoids is the best I have ever found. I take 1000mg a day and it's easy on the stomach. Good size capsule, easy on the stomach. Great price. Ester-C 500 mg with Citrus Bioflavonoids really boosts my immune system against the common cold. No colds for three years. Just a plain good product and form of Vit. 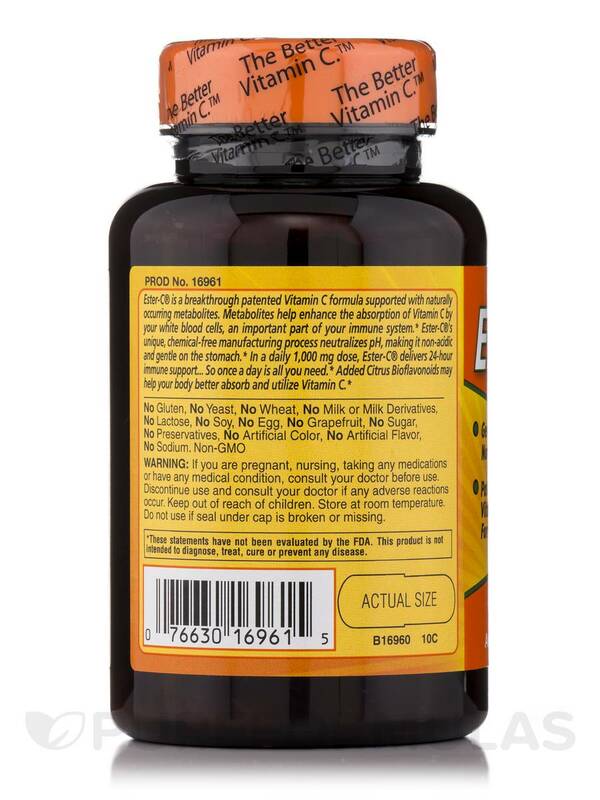 C.
Ester-C 500 mg with Citrus Bioflavonoids keeps C in your system for 24 hours, and gives you the extra added benefit of Citrus Bioflavinoids Complex i meaningful amounts, which has anti inflammatory properties of its own. Excellent product! I was struggling with a horrible series of sinus infections. Doctor's kept trying to pump me with antibiotics, which didn't even help (provided relief for a week then i was sicker than before). I gave up and just rested for a week (still went to school and everything but took it easy), I took Ester-C 500 mg with Citrus Bioflavonoids by Ester-C and gargled salt water multiple times a day. I've been feeling good ever since, ( and my sinus issues cleared up after 3-4 days) this is a vital supplement for someone like me. I have used this Ester-C® 500 mg with Citrus Bioflavonoids by Ester-C for a couple of years now and it has never caused me to have a reaction from the acidic nature of the C contends, however, I am having other problems from the other ingredients . Whether it's Magnesium Stearate or Stearic Acid, vegetable or not, theses additives are harmful to the body. I feel bad, because otherwise this is a great product. Because I have to take high doses of vitamin C I just cannot take a chance on these additives in this product anymore. Ester-C 500 mg with Citrus Bioflavonoids by Ester-C is supposedly the only type of vitamin that is truly easy on your digestive system. It never upset my stomach even at high doses..
Great price, fast shipping, easy on stomach. Would prefer if citrus bioflavinoid component were organic, but it's not enough to cause me to not buy it.